[Translate] My love for desserts has never deterred but my preferences has certainly changed and yearn for something unusual. Don’t get me wrong. I still love my chocolate but it has to be dark and not too sweet (unless I have a craving for sugar). I remembered recently reading the Wall Street Journal about (white) miso accented desserts and it’s one of those “why didn’t I think of that” moments since I adore and obsessed with salted caramel or anything sweet and salty in a dessert, it makes sense for miso and its fermentation adds an umami effect that bridges..
[Translate] I’ve recently tried experimenting with two great brands — deZaan Gourmet for their fantastic chocolate and cocoa powders and Redwood Hill Farm goat’s milk dairy products. deZaan brings a century of tradition, quality and technical leadership to an impressive portfolio of premium cocoa and chocolate products, including cocoa powders, cocoa butter, cocoa liquor and custom chocolate formulations. Their cocoa powders are available in a variety of flavors and color shades — from vibrant reds to dark browns and black — with various accompanying taste profiles and intensities. Redwood Hill Farm is an award-winning, goat dairy farm and creamery located..
[Translate] For the past several weeks, it’s been a crazy, busy several weeks for me, primarily with work and planning my upcoming trip to London. 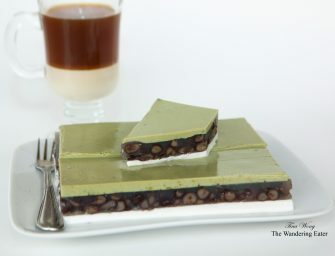 I wanted to make a simple but tasty but minimalist beautiful dessert that also has Asian flavors since they were all in my pantry – matcha green tea, adzuki red beans, and coconut milk. Come to think of it, this sweet is pretty healthy since there is no cream or butter involved. This jelly is made with agar, a vegetarian alternative to gelatin that’s normally sold in powdered or flake form. There is generally a..
[Translate] Recently, Driscoll’s was generous to send me some of their wonderfully sweet-tart raspberries for me to bake with. Inspired this weekend for the spring-like weather we were finally having in New York City, I wanted to bake something “happy,” if that make any sense. For me, one of my happy memories was when I was in Paris several years ago and brought my ravenous carb and sweet tooth, saw and ate my way through the city. One particular pastry that stuck in my mind that looked elegant and feminine when I passed by a few patisseries, which I found..
[Translate] The folks over at Kerrygold were sweet to send me a package of a few of their delectable light cheeses and their wonderful butter in aims to create a lighter, healthier dish. If you read this blog long enough, you’re aware that I don’t necessarily bridge the two unless I do feel insanely gluttonous. I like moderation and more on the lines of flavor trumps healthiness (especially desserts!). With that all said, I woke up one morning craving a bowl of savory oatmeal since I eat many variations of the sweet versions too often and had a craving for..